Disappearing into the narrow streets of Marrakech's large medina, this is the word that leaps to mind. People, bikes (pedalled and driven - all heading toward you), cats, donkeys, stalls and sellers; a cacophony of sights and sounds that can be overwhelming to the uninitiated. And yet, disappear down a small alley and you will discover that the ancient pink city holds a secret or two; an oasis of calm, hidden behind giant metal doors. 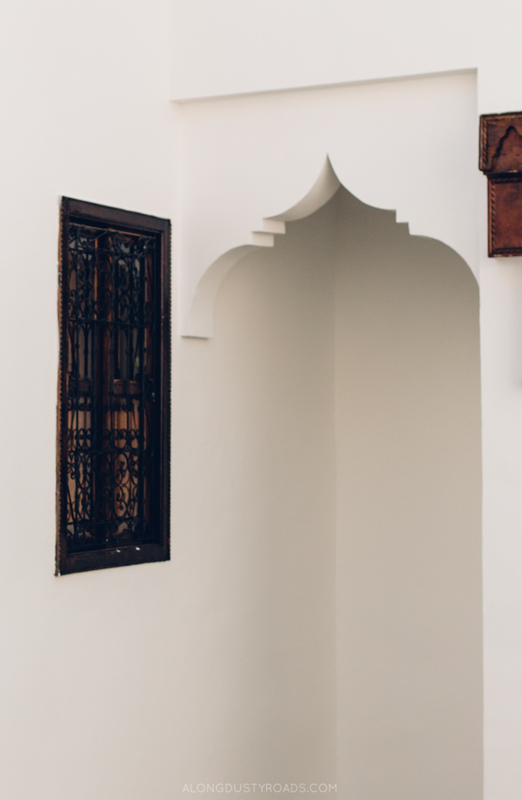 The secret we discovered on our first day in Marrakech was Riad Porte Royale. Greeted at the old city walls by Lahcen, the riad's manager, we were led quietly along shadowed passageways and through the door of our new home. Bright white walls, with bursts of green foilage, a pretty tiled floor, and - surprisingly - silence, the noise of the medina shut away with the turn of a lock. As with all riads in Morocco, this was once a family home; a place of sturdy walls, many rooms and a sunlit courtyard. Keen to retain the beauty already present in this centuries old building, the author-owner Phillip, with the assistance of master craftsmen, has created a boutique accommodation that treats all who stay to a genuine riad experience, with a touch of class. From the thoughtfully curated library and the hand-painted ceramics, the traditional artwork and tapestries that adorn the walls, and the beautiful wrought-iron lamps, Riad Porte Royale captures the very best of Moroccan design, whilst retaining contemporary lines and white-washed walls. The 5 bedrooms (four doubles and one twin) have all been individually decorated, with original antiques and furnishings sourced from across the world. We were delighted to spend our nights at the at RPR in the 'African Room'. Beautifully crafted wardrobe doors from the Dogon people of Mali and masks from the Warka tribe and Gabon; carefully chosen accents that compliment the room without distracting from the Moroccan riad motif. Opening up on to the light filled courtyard, on the warmer days, it was wonderful to leave the heavy wooden doors of the room open, and allow a cool breeze to pass through the curtains. Breakfasts in Porte Royale can be taken anywhere in the riad. On sunny winter days, the bright roof terrace, home to two tortoises, is a fantastic place to enjoy freshly squeezed orange juice, brewed coffee, a variety of baked goods, jams and excellent honey, or for a little more shade take a seat at the pool edge and watch the birds vie for your attention. Riad Porte Royale was a fantastic spot to base ourselves during our time in Marrakech. Located in the north of the medina, it allowed us to escape the craziness of the souks and experience the local neighbourhood, whilst still being only 15 minutes walk away from all the main attractions. Bookings can either be done on a room-by-room basis, or, if you're travelling in a large group, you can pay for the entire riad for the duration of your stay. Room start at 60 EUR for two people, including breakfast. For further information, and booking enquiries, visit their website. Address: Derb El Maada 84, Diour Jdad, Zaouia El Abbessia, Marrakech Medina. Looking for more beautiful riads in Marrakech that won't break the bank? Then the good news is that we've done the hard work for you - take a look at this post to discover the very best budget riads in Marrakech! We were guests of Riad Porte Royale, but all opinions, as always, are our own.